Located in Chelsea's landmark 1929 Art Deco-era Walker Tower, replete with stellar works by visual artists Cindy Sherman, Ed Ruscha, Vik Muniz, Edward Burtynsky and James Rosenquist, and paired with furnishings by midcentury greats such as Paul Evans, Ico Parisi, Vladimir Kagan, Jules Leleu, Philip & Kelvin Laverne, Jean-Claude Dresse and Poul Kjærholm, this home is serenely luxurious. 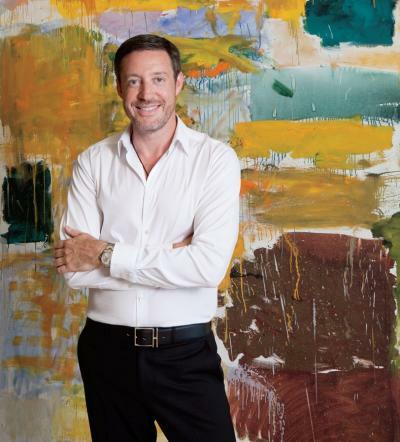 Designer David Scott wove together what could have been an overwhelming group of elements into an elegantly flowing series of chiaroscuro vignettes with chic lighting, sumptuous Carini Lang rugs and textural wall finishes. 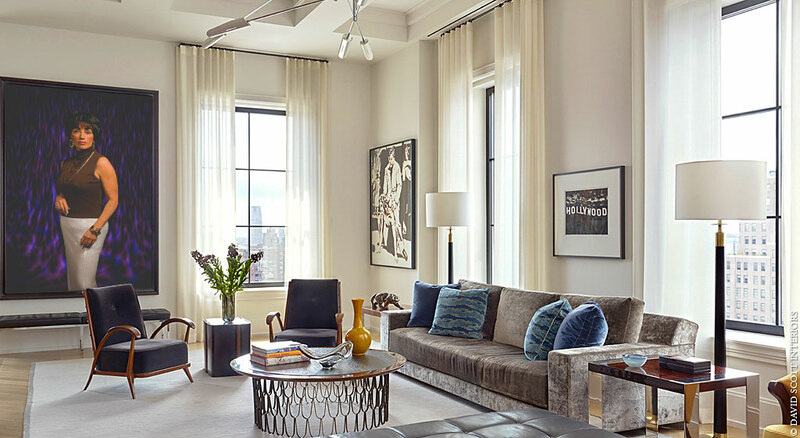 The result is a comfortable, luxurious and elegant home where the furnishings and finishes beautifully complement the impressive art collection and breathtaking city views. 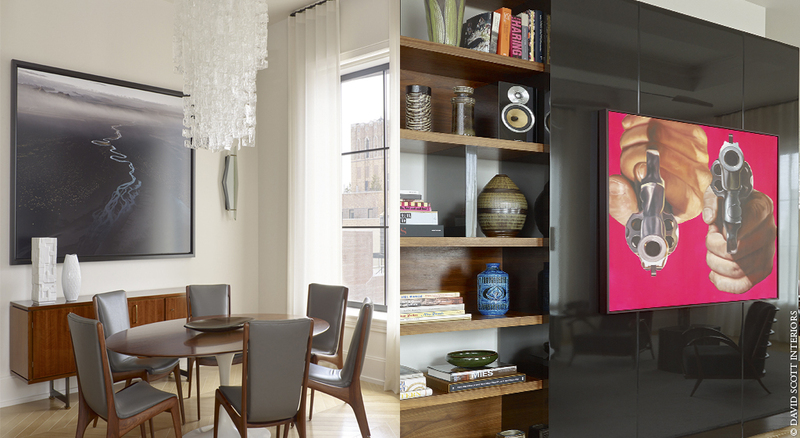 Artwork seen in the living room above: One of Cindy Sherman's larger-than-life portraits from 2008, Untitled #467, and La Dolce Vita by Brazilian artist Vik Munez, from his Pictures of Chocolate series, which were rendered in Bosco chocolate syrup. Furnishings include a Paul Evans and Phillip Lloyd Powell 1960s fishscale cocktail table, constructed of gilt wrought iron with slate top; a pair of Ico Parisi walnut armchairs; and a sofa by Holly Hunt. The light fixture is by David Weeks Studio. 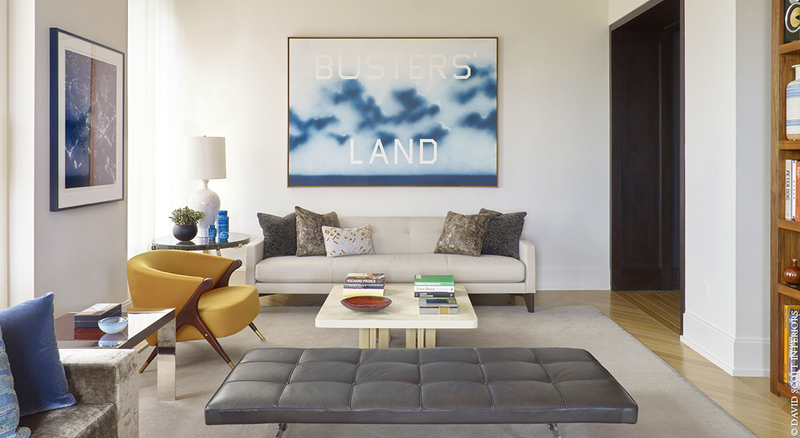 Hanging at the opposite end of the living room is Ed Ruscha’s 1993 acrylic on canvas painting Buster’s Land. 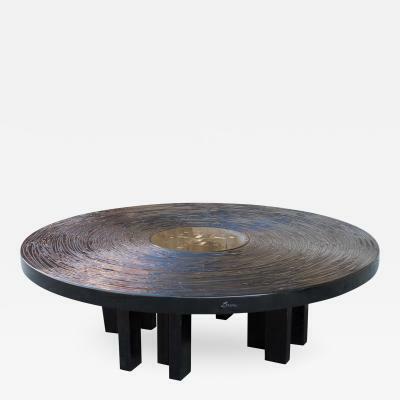 The 1970s cast resin and bone cocktail table is by Belgian artist/designer Jean Claude Dresse. 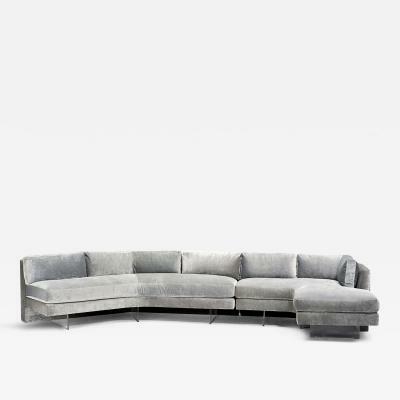 A gray leather PK 80 daybed designed in 1957 by Poul Kjærholm is seen in the foreground. A vintage midcentury modern lounge chair is by Karpen of California. At left, in the dining room, a walnut top Saarinen Tulip table is encircled by Vladimir Kagan dining chairs. 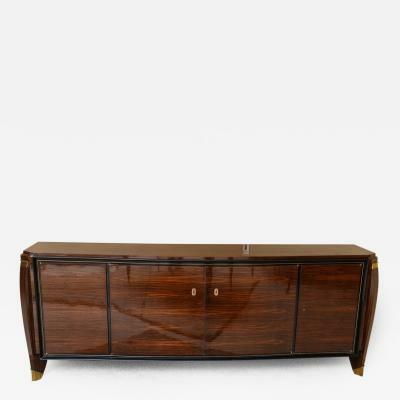 The sideboard is by Jules Leleu, circa 1960s; a large photograph by Edward Burtynsky hangs above. At right, in another view of the living room, a bookcase displays a collection of Scandinavian ceramics, and an attention-getting James Rosenquist painting. The day-glo cerise background of Target II from his 1990s “gun” series adds a surreal, almost Pop-Art quality to the controversial subject matter. The guest room/study boasts an inviting Vladimir Kagan Omnibus sectional sofa, with a Philip and Kelvin Laverne cocktail table. Photographer Nan Goldin’s super-saturated 1979 silver dye bleach print Trixie on the cot, NYC is seen hanging above the sofa. Neutral-toned textured linen wall covering and a silk Carini Lang rug add elements of quiet luxury. 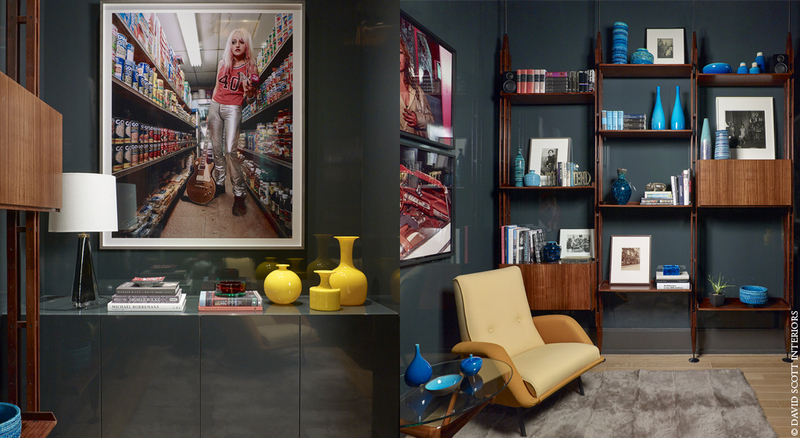 Two views of the study — at left, a lacquered wall-mounted cabinet custom designed by David Scott, with another contemporary photograph from the owner’s impressive collection. This one, titled Gina (Lunachicks) in the Bodega NYC, is by Katrina Del Mar. 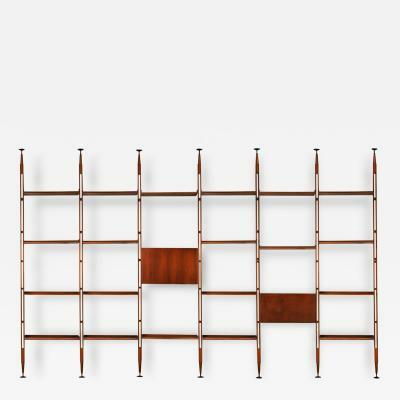 In the view at right, Franco Albini’s modular LB7 walnut bookcase, designed in 1957 for Poggi, fastens to the floor and ceiling and was designed to allow the shelves to be reconfigured. Works by Nan Goldin are on the wall at left. 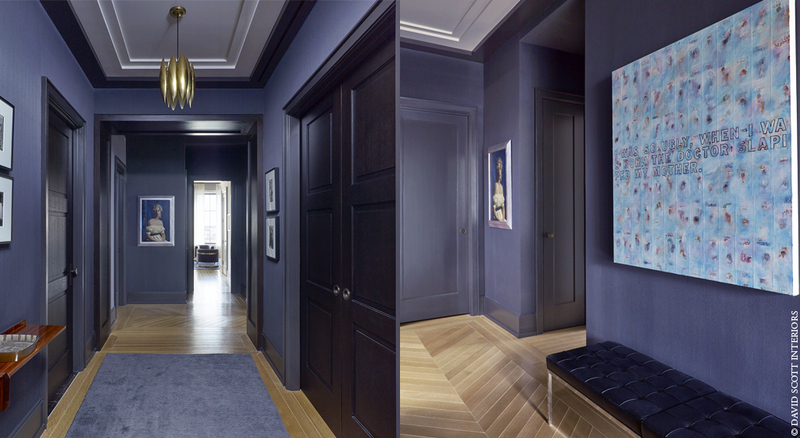 In two views of the entryway, evocative colors and lighting set a tone of dramatic anticipation. Charcoal gray silk wallcovering with black doors and moldings and works of art, hung gallery-style, offer a hint of what’s to come.